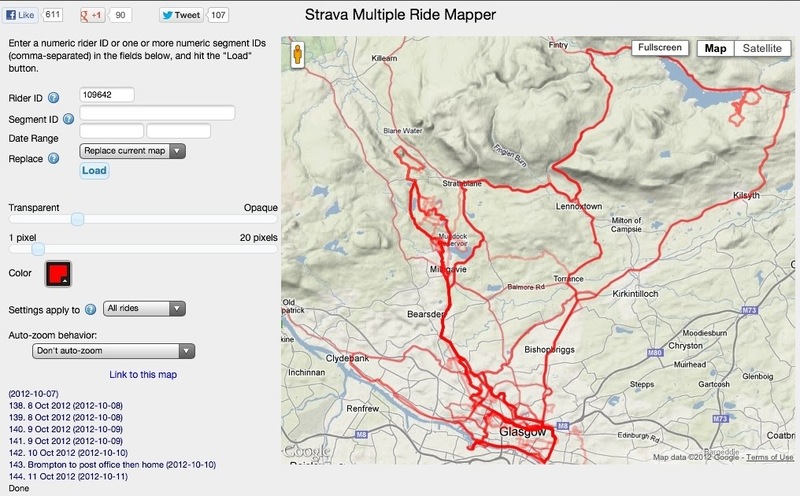 This great app / (website) pulls in all of the rides and runs you’ve ever logged on Strava and displays them on one map. Simply copy and paste your athlete number into the box and be amazed as it pulls in every ride and maps it. If you are struggling to find your athlete number then hit profile in strava and it will show a number in the address bar – this is you. The website uses opaque lines so if you’ve ridden or run certain roads many times, you will end up with a darker line, whereas roads you’ve only ridden once will be more pale. The map is clickable, and the list on the left hand side takes you back to the ride screen on strava.com if you wony to see an indication of frequency then set opaqueness down to see all your routes clearly. Here is a map of some of my rides over the last few months – some road, a few mtb and one or two commutes or runs. Created by the same author as the multiple ride mapper above, Jonathan O Keefe, the KOM notifier service will give you detailed notifications about any changes to your KOMs, or indeed any changes in the top 10 positions. Yet another brilliant bit of coding from Jonathan again, Segment Details can be accessed separately as a standalone thing, but it is also linked from the Strava KOM Notifier Service, above. This one is really useful for tracking the history of a segment – who’s been KOM in the past, when did so and so take it, how many people have ridden it, what’s the average time taken etc. RaceShape is essentially about analysing the differences between people riding a segment. Say you lost your KOM or if running your CR to someone – you can use this tool to analyse where they were quicker, and so help you to develop your strategy. It works by analysing how the gap changes between two riders, and works with segment data from Strava or Ride with GPS. Here is a screengrab of a flat canal path section that I took my road bike on – it analyses your time over distance and although I am 3rd on this section I can see that in the first wee bit of the trail where I was chatting to someone with a flat tyre – suddenly that is the 40 sec gone. Although slower than no 1 and possibly no 2 it was close. Using no 2 as a baseline you can see where I level out and we are quite matched. By comparison my friend Keith did the route and you can see the slope of his pace and where I eventually catch up and pass. So now that I know this is a section I might just burn it along here (although not on a weekend when there are so many dog walkers perhaps. It gives you more stats to play with and get twitchy about than you might ever want. Dig around and you’ll discover a great new way to explore the segments you’ve done, and get ideas about which ones you want to revisit. Tip: Click the table column headings to sort on that column. You can sort this on average speeds or overall length or steepness and so on. You’ll discover segments you’ve already done, but never realised were there, prompting you to think about targeting them for a serious effort. Here is a mtb climb once again using Michael D as the base line and my pal Stuart who is notionally behind me. Interesting to see I started fast but burnt out a bit on the muddy section with the big puddle. 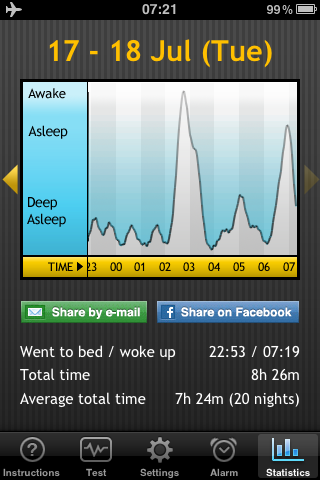 I could pretend it may have been dry on the days the others did it or it could just be that I was tired. Stuart and I swap the lead a lot towards the end. Does really let you see where others or quick and where you are slow. Finally some apps I think are good enough for Heart Rate monitoring and Running and time on the bike. AscentMobile allows you to record, display, and analyze activities involving movement. Tracks can be recorded on the iPhone using the internal GPS, or downloaded via WiFi from the companion desktop application “Ascent”. 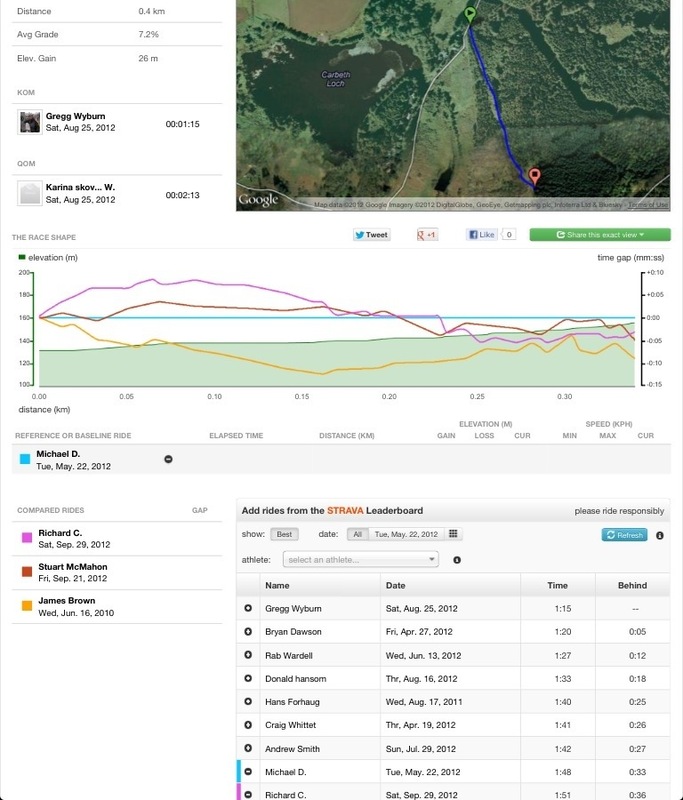 Altitude profiles and maps are displayed, as well as various reports and graphs that show your performance over time. Tracks recorded on the iPhone can be sent as an email attachment to your favorite email account for loading into any other compatible program or web site. Your pocket bike computer. Whether you use a mountain bike or a racing bike, Biky Coach is your personal trainer that helps you keep track of your progress and meet your fitness goals. Train yourself with your personal coach while listening to music and sharing your progress with friends, all with Biky Coach’s many features. Using the GPS feature of your iPhone, Biky Coach provides real time information of all your race statistics (speed, distance, elevation, calories burned…) and stores them for later review. 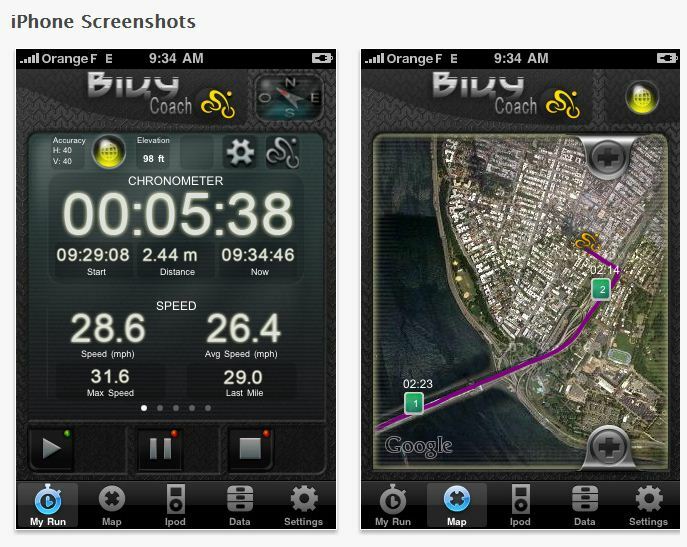 Biking Coach gives you all the information you would get from a GPS biking computer but for a fraction of the cost ! View your statistics with any of the 15 customizable graphs available. Unlike other applications, there is no need to upload your data to a website to analyze your results so you can quickly track your progress right in the app itself. Biky Coach will give you personalized vocal updates on race statistics through your earphones! Hear all your stats including distance, speed, calories burned, and amount of time lapsed without slowing your pace or breaking your concentration to check your phone. Allow your friends to follow your progress on Facebook, Twitter or by mail. 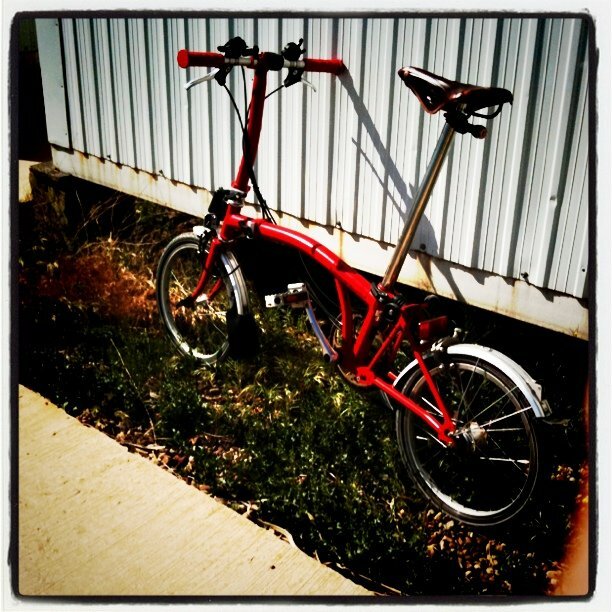 Biky Coach is now compatible with ant+ fisica key and heart rate sensors. REQUIRES the Wahoo Sensor Key or Wahoo Sensor Case, enabled by ANT+ technology, and compatible fitness sensor. Visit http://www.wahoofitness.com for more information on compatible sensors and more information. Wahoo Fitness App takes advantage of all of the existing ANT+ sensors in the market including power meters for cyclists. 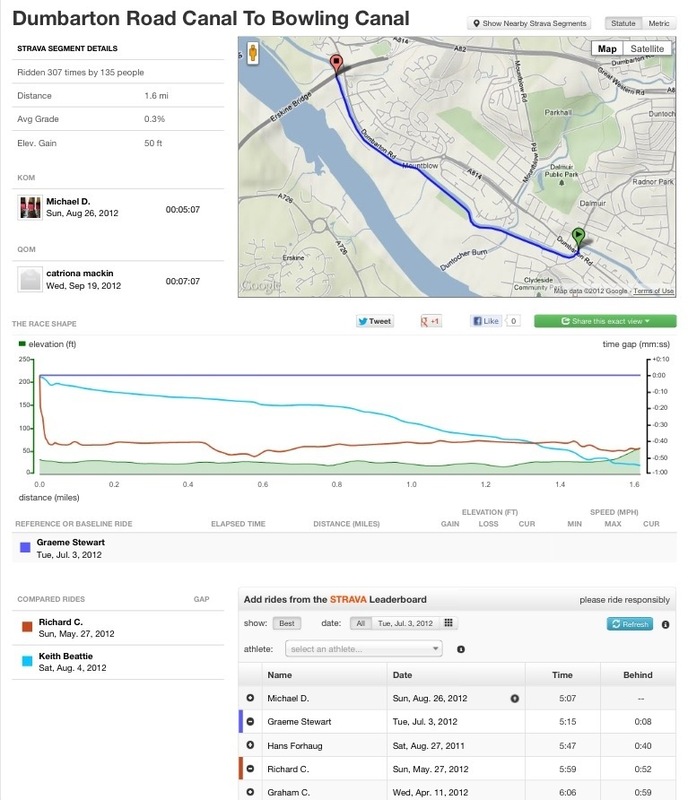 It supports automatic upload of workouts to MapMyFitness, Nike+, TrainingPeaks, Garmin Connect, Strava and also exports files via email for upload and analysis anywhere! We’ve added several new features with V2.0 including importing wirelessly from select Garmin devices and free Live telemetry via MapMyTracks. 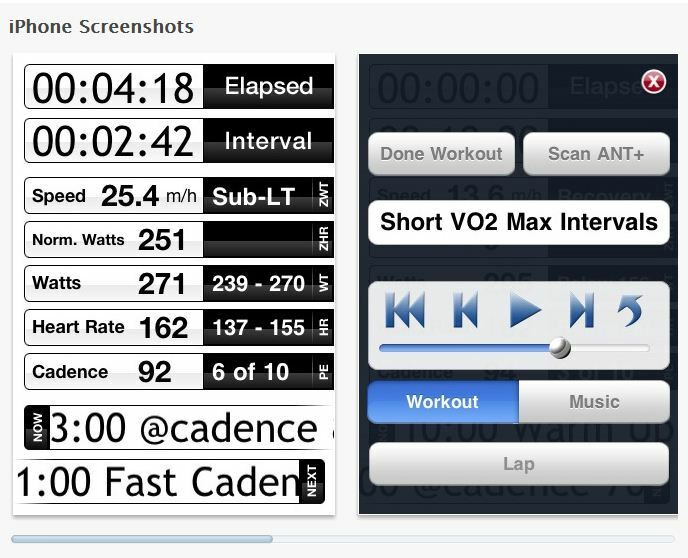 iMobileIntervals (iMi) turns your iPhone or iPod Touch into a powerful cycling or running computer. iMi is GPS and ANT+ capable with a feature-set to beat any of the leading hardware solutions. Telemetry to webpage-embeddable widget. Optional use of speech technology or tones to guide you through your workout. With the WahooFitness Fisica ANT+ accessory, see your HR, speed, pace, cadence or watts, just like the leading hardware solutions costing hundreds of $$$. Uses GPS for speed/distance/pace if no ANT+ stride, speed or speed-sending power sensor is detected. Moving map of athlete’s location. 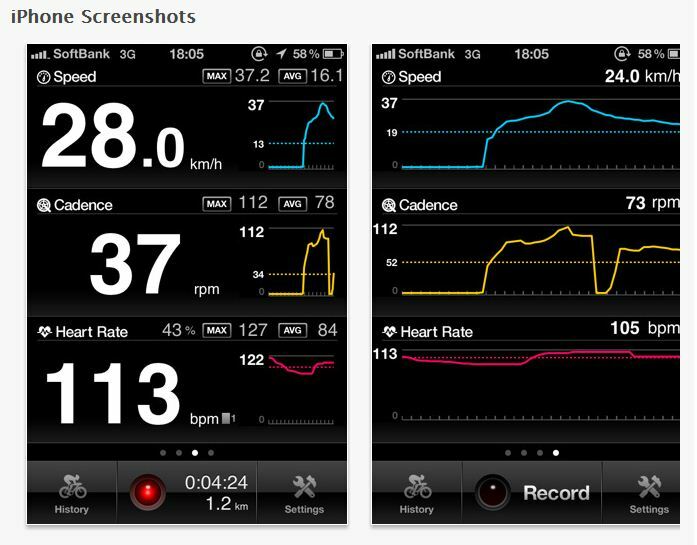 Telemetry: Send live data, viewable in embeddable widget or custom imobileintervals.com page. Includes a moving map. 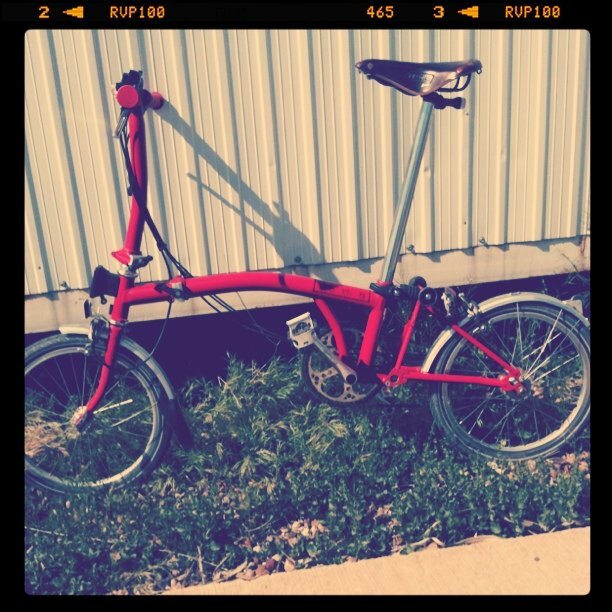 Not dependent on WahooFitness accessory. All brands of ANT+ wireless stride sensors, speed sensors and powermeters are supported by the WahooFitness accessory. Direct upload of data and route to Nike+, including heart rate. TrainingPeaks workout calendar integration, both reading workouts and sending results: Automatically log completed workouts directly to TrainingPeaks, and see your data graphed immediately. iPhone GPS Location track data logged to TrainingPeaks and Nike+. 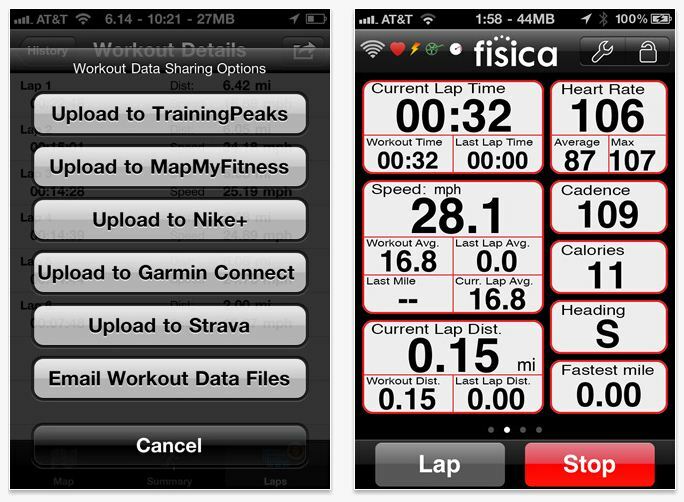 Works offline; app saves multiple workout sessions and reports when network becomes available. You can view the full list of compatible devices on the LiveCycling website. Your iPhone will turn into an high quality Cycle Computer! 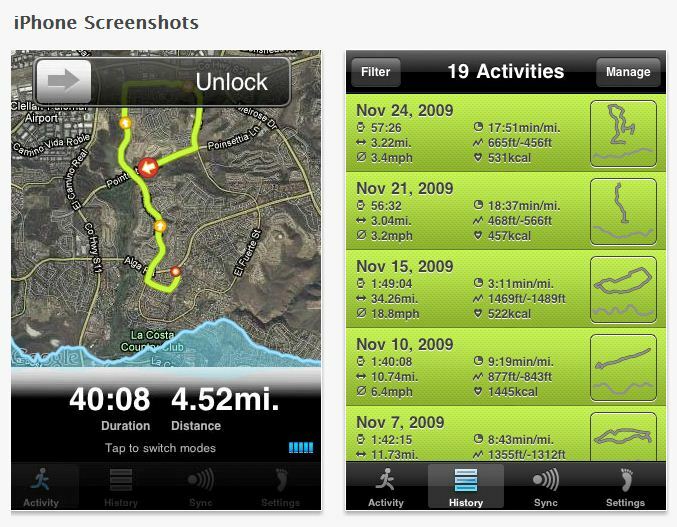 Turn your iPhone 3GS and 3G into a fully fledged activity recorder with rubiTrack Recorder! With rubiTrack Recorder you can record all your outdoor activities like biking, running, walking and hiking. 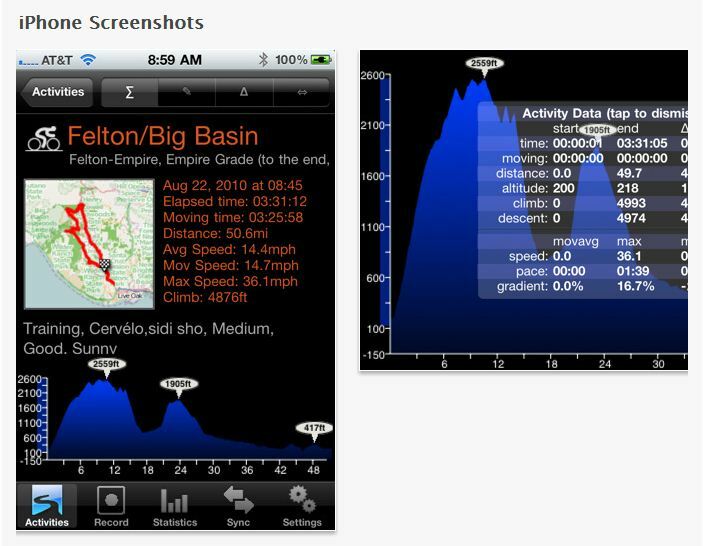 The activity recorder displays a live track preview with optional maps background with compass arrow and elevation chart. rubiTrack Recorder lets you lock the device so you can put it in a pocket during the recording. The history lets you quickly review and compare done activities showing their most important data and instant track and elevation charts. In conjunction with the Fisica dongle by Wahoo Fitness and compatible ANT+ sensors, rubiTrack records and saves sensor data from heart rate, cadence, speed, power and footpod sensors. rubiTrack Recorder directly uploads to rubiTrack for Mac via Wi-Fi without having to upload your data to an online web service. We’d all like to improve our sailing, but often it’s hard to really know what to improve. On a typical weekend, the good guys are quickly in front and there is no way to tell what they are doing right and you wrong. Sometimes a race is lost on a “bad leg”, but what actually happened and what went exactly went wrong? Often we never find out. How do we identify our current weakest point of sailing that we should be attending to first? What is needed is information; hard facts, that are often not available to you on the race course. With the availability of inexpensive GPS tracking devices, such as the QStarz BT-Q1000X, it’s now easy to record a boat’s track around the course. And with TackTracker, you can play your GPS tracks and watch the race again, as it happened or navigate tack by tack. But TackTracker is much more than just a player. It is a race analyser, and can give us leg by leg information on how far we have sailed, how fast we were going, and how high we pointed on both port and starboard tack.TackTracker can even deduce the ambient wind direction, and indicate which tack a boat is on at any time, and whether it was close hauled, reaching or running! Its fun to play your track around the course, and there are plenty of things to learn. The real value is attained when a number of sailors get together and share their tracks with each other. 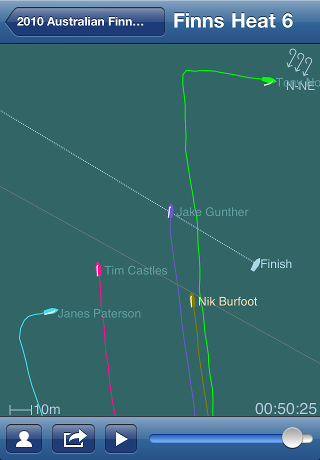 Then you can ascertain who travelled the shortest distance on the windward leg, who was sailing fastest, and who highest. At moments in the race where you may have fallen back, you can see what you were doing in relation to the other boats you were competing with. TackTracker is designed to deliver a complete solution, streamlining and automating the entire process from uploading tracks into the software, archiving and managing tracks, to viewing and playing tracks. The track browser maintains a library of your tracks organised by date, so you can easily find tracks from past races. You can select individual tracks, or an event (race) which may contain multiple tracks. As each track or event is selected, it is displayed in the track player. The track player has a group of navigation buttons at the bottom, which you can use to drive your boat around the course. You can also press “Play” and sit back and watch. Then speed up and slow down the action as required. The track player lets you pan and zoom with the mouse, or you can turn on “auto zoom” to have the player automatically track the race boats. You can also drag the mouse to create a distance and bearing meter allowing you to assess the separation between boats at any point. Races are defined in the “Event Editor”, where you set the start time and lay the course marks. This is all done graphically, allowing you to define the course in a matter of minutes. Once the course is defined, all participating tracks are analysed and all race legs computed. The Legs table gives you a summary of all the key statistics for each leg for each competitor. You can sort the table by any column to compare results for any leg or competitor. Powerful! 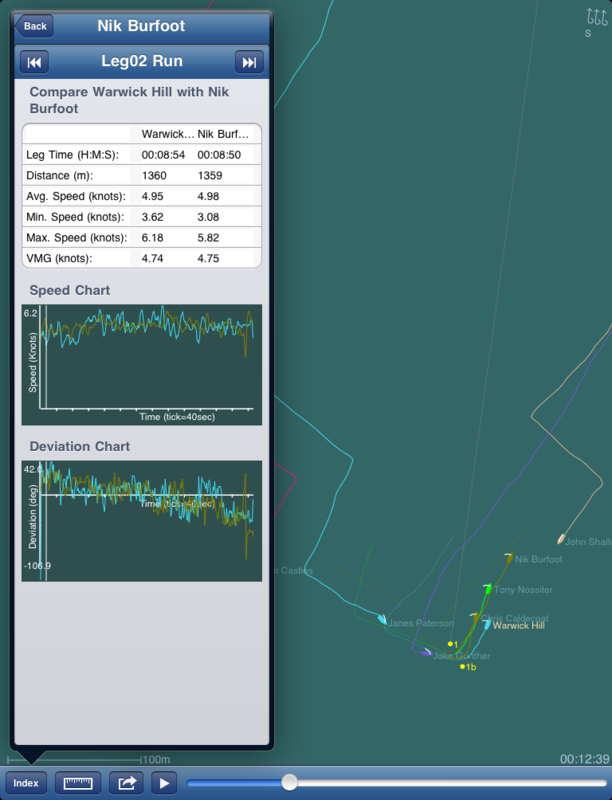 TackTracker also has a great range of interactive charts that provide additional insight into your boat’s performance. The speed chart shows boat speed over the course of the current leg, whilst the deviation chart shows how high or low you are sailing to the true course. Together, these charts are an effective visual summary of your sailing efficiency. There’s lots more to TackTracker, but this will serve as a quick introduction. To learn more, the best thing you can do is download and install the free race player from the Download page. You can watch and interact with races available online that have been recorded at regattas for a range of classes. You can also read the User Guide, available from here. 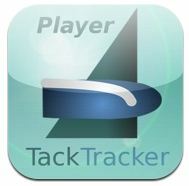 I hope you have fun using TackTracker and that it helps you improve your sailing. New! You can now get a TrackTracker Player for your iPhone and iPad. You can browse the online races database and play and review all the racing from the convenience of your handheld device, wherever you are. You’ll be impressed by the full-featured player with multi-touch panning and zooming and all the familiar graphics from the PC players. 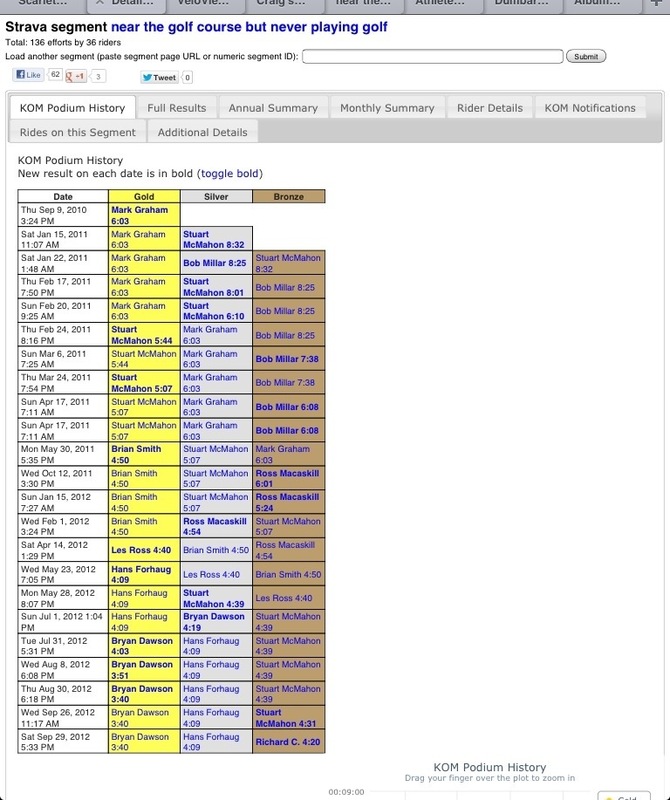 Includes a full regatta browser, competitor selection, and leg by leg stats and charts. See stats and charts for any two competitors side by side. This new player is the first manifestation of a significant investment TackTracker is making in the Apple platform. We now have all the core software running natively in Apple’s application frameworks. Stay tuned for more to come. Searchable Regatta Index. Tap any Regatta to see the Regatta detail, including a photo and list of races. Player: Note you can tap in the player to hide the top navigation bar. The iPad is a wonderful medium for TackTracker, with plenty of screen real estate for a compelling replay wherever you are. Found this last night a really handy app for pace calculation as well as being a predictor for race times over different distances. 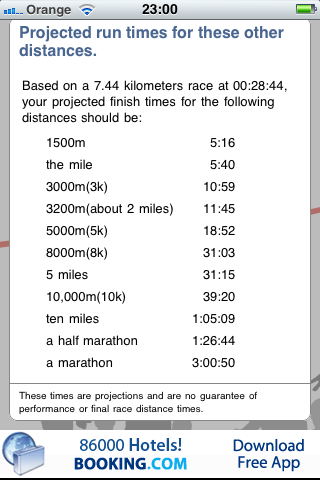 I based this on my last race and must say it predicts a 3h00 marathon time which is frankly very flattering. But although it is just a guide it also is quite motivational and makes me want to enter and train for one. If I do enter a marathon my only desire is to beat my brother-in-law’s time which was 3H31 and he is 10 years younger than me. I have done a half marathon before and did a 1H42 with no training and crappy running gear. Will have to check my work schedule and see what I can do.